If you think asteroid strikes are scary, I've got some bad news for you. The most deadly events on Earth are caused by . . . Earth. New evidence suggests that underwater volcanoes may have wrecked our planet for thousands of years, and ultimately allowed dinosaurs to rule the world. We've all heard about the mass extinction that destroyed the dinosaurs, but what about the mass extinction that allowed them to take over the world? About 200 million years ago, before the dawning of the Jurassic period that marked the giant creatures' heyday, there was a warm, tropical period known as the Triassic. Trees and flowers covered the land masses, proto-dinosaurs and proto-crocodiles ate each other's faces off, and aquatic reptiles swam around coral reefs in the oceans. But the Triassic ended with a global apocalypse that wiped out over 75 percent of species on land and in the oceans. In fact, this event was so Earth-shattering that it literally created an ocean. The Atlantic is the result of a huge underwater "large igneous province," or a long crack in the planet's crust that vomits up lava and gas. It's basically a volcano, but instead of shooting lava out of one hole, it shoots out of a big fracture stretching across a large area. 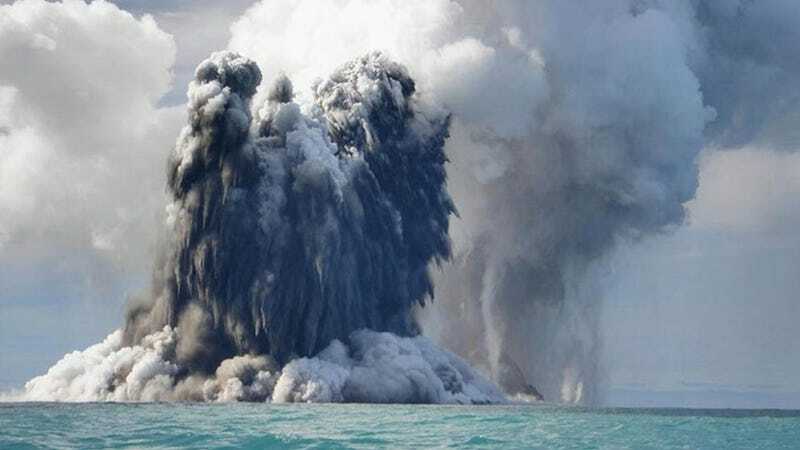 This particular fracture spewed out so much lava that it pushed North America and North Africa far apart, allowing an entire ocean to fill the region between the once-connected continents. As a result, geologists dubbed this mega-volcano the Central Atlantic Magmatic Province, or CAMP for short. CAMP erupted on and off for about 600 thousand years, starting roughly 200 million years ago when the Triassic was winding to a close. Though geologists have long believed that CAMP was probably responsible for the mass death on the planet around this time, it's very difficult to pin dates on volcanic eruptions. But today, a group of scientists have published a paper in Science that establishes very persuasively that the dates on those volcanoes coincide with the dates of the first mass deaths in the end-Triassic extinction. The researchers used a variety of dating methods, including one that accounts for the Earth's magnetic polarity at the time of the eruptions, as well as atomic decay in zircon minerals. An emerging model requires the near-instantaneous eruption of large volumes of magma (ca. 8×105 km3 ) in order to explain: 1) the apparent increase of atmospheric pCO2 values (12, 13, 34); 2) the near collapse of coral reefs and absence of carbonate deposition, both thought to be triggered by the decrease in the pH of ocean seawater (14, 15) and; 3) the approximately ~5-8.5 ‰ negative excursion in organic δ 13C values observed in both marine and terrestrial records, suggesting a large input of atmospheric carbon (35–37). In other words: the volcano shot a ton of carbon into the atmosphere and acidified the oceans (killing corals). Basically, the Earth destroyed itself, by polluting the environment. The Triassic era began with a volcano-caused mass extinction too, at the end of the Permian period. It's possible that volcanoes were involved in the extinctions of the dinosaurs, too. The more we learn about these deadly mega-volcanoes and magmatic provinces, the more it seems that they may be the most dangerous threats to life on Earth.